Get your kitchen organized, get a pull out waste & recycling unit. Are you tired of having those big heavy recycling bins in your kitchen or garage? Why not get your kitchen organized and get a pull out waste & recycling unit from WoodCraft. I absolutely cannot stand having to look at the recycling bins. Their bright blue and green color is not very conducive to my color decor in my kitchen, and probably most kitchens. 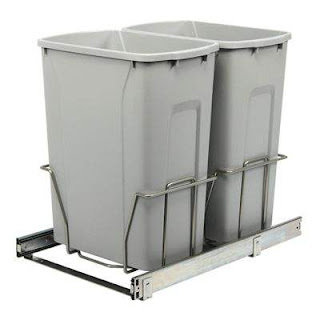 Using this organized pull out waste and recycling unit holds two 35 quart bins. Keeping all your recycling under wraps and out of the flow of the kitchen. This unit is made of steel construction, with heavy duty ball bearing slides. This unit is really easy to install, needing only four screws. The assembled dimensions of this unit are: 18.75”H x 14.375”W x 22.563”D,requiring you a minimum opening of 15". Get your kitchen organized and get your recycling and waste under wraps today. Be still, and keep your wine chill! I have always wanted a wine refrigerator in my home. My aunt and uncle had remodeled their home, and when they redid their kitchen they added Wine Enthusiast - 24-Bottle Wine Refrigerator. I love my home refrigerator, however it only holds wine bottles if they are laying down. I have corked a bottle of wine before and ended up with an entire bottle of wine at the bottom of my fridge. Swan Creek Candles, Scentsy or Glade Scented Wall Plugins? When I come home from a long of work the last thing I want to smell is my kids tennis shoes, the dogs or the garbage can. I have yet to find a product that actually takes out the odor while refreshing the air, instead it just temporarily covering it up. I have tried just about everything from Swan Creek Candles (which I love in my bedroom but they just don't take out harsh odors) Glade plug-ins, room sprays, scentsy's etc... you get the picture I have pretty much tried everything. I have noticed the best results for banishing odor of the source by using baking soda and water mix and spritzing it all over my garbage can, the dogs bed and the entry way (where all of the shoes are housed). I added in a bit of essential oils and have found that it does help cut down on the smell a bit. That mixture plus Glade Plugins and scentsys help to fill up the house with a fresh scent (I usually go for spring/clean smelling waxes). If you are looking for a calming scent to fill your bedroom up at night I love lavender scented swan creek candles. They burn slowly, and evenly, and fill your room up with just the right amount of scent without being to overbearing. I would recommend this for anyone, but if your looking for a strong deodorizer give the DIY spray a try! 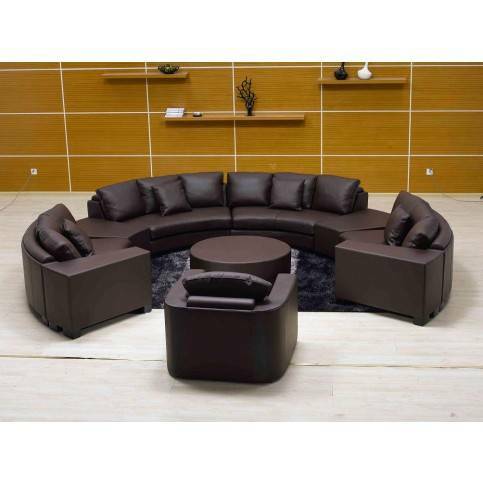 I totally had an Austin Powers moment when I saw this circle sectional living room set. This is a fun piece of furniture that would be great for entertaining. There is a great deal of seating, for entertaining your dinner or cocktail guests. Would you be able to entertain all of your guests with this fun couch? We love to entertain with friends and family, we are always having people over for dinner parties or even movie nights. Often time in the summer time we are outside, unless the weather is raining or cold and than we bring all the fun inside. This couch would be great to have for our birthday parties too, so many people try to cram on to our sectional couch we have now, no where near enough seating. This fun couch is available in seven different colors, which one would you choose? I found this unique Black Modern Coffee Table, I love the base and its cool design. It is a beautiful piece of furniture that amazes me how the table top will stay steady on its pedestal. This is a fun funky piece that will look great with any retro decor. Coffee tables have many uses and have really become a staple in almost every living room space. Coffee tables have become home to an assortment of everyday items. Such items like, magazines, coasters, tons of remotes and even books. The coffee table in our home is the center point to our living room, and is our favorite piece in our living room. We set our drinks on it, we set our popcorn bowls on it, and relax our feet on it when watching our movies! What is on your coffee table? 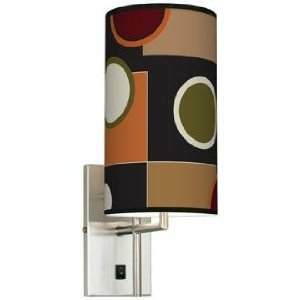 Ok, so I just found these really pretty Retro Medley Banner Giclee Plug-In Sconce that would look really pretty up in my hallway up stairs. There is only one problem, I would have to repaint upstairs in the hallway so that they could match. Since I really enjoy painting I guess that really isn't a problem than. Although the weather here hasn't been that of weather you can open your windows too and let some ventilation in. With three small kids and all their rooms on the upstairs level, I don't dare paint until I can open the windows. Matter of fact we still have some snow on the ground, it is supposed to rain tomorrow and get up into the 60's but than snow again on Monday. I just want Spring to make it's appearance and enjoy some nice weather before we get blasted with the summer heat. I have plenty of inside the house projects that I could be working on, however I do need my windows open for some of those projects! How is the weather in your area? Can you open your windows? 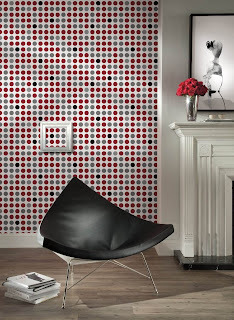 Fun idea for an accent wall, Wall in a Box Retro Dots Wallpaper! I have always felt that every room in your home needs an accent feature, whether it is a color, pillows, a lamp or maybe even a wall covering on one wall of your home. 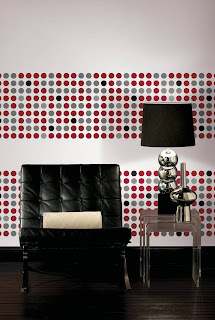 I found this fun idea for a Wall in a Box, Retro Dots Wallpaper. 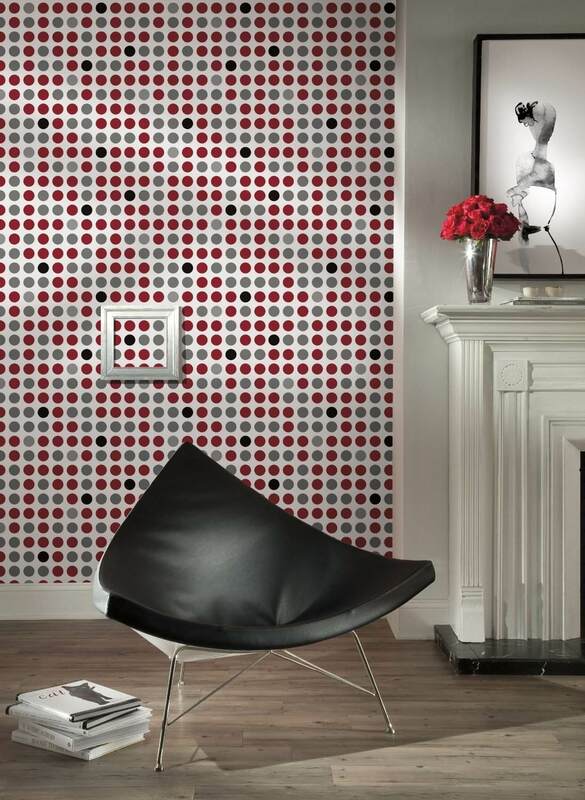 This is a great way to add an accent wall in your bedroom, living room, bathroom or even in your kitchen. 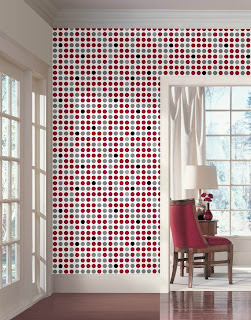 A pop of color in every room is a great way to add color, detail, as well as creating a focal point in a room. You could create your own wall features using a couple pieces of plywood from your local hardware store. 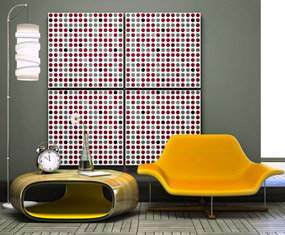 By applying the Wall in a Box wallpaper to the wood, you can create your very own wall art. The directions are as follows and it doesn’t get any more manageable than York’s easy three-step application process: measure and cut the first strip of pre-pasted wallpaper included in the kit; dip it in the filled water tray to activate the paste; and place and smooth the paper onto the wall until complete. Its easy-on, easy-off application is guaranteed when installed properly using York’s more detailed instructions (included with the kit). With a straightedge smoother and a utility knife included, York provides every tool necessary for transforming an entire room—all conveniently available in one box. No Storage Space? No Problem! Enjoy your view, even when the TV is off! !